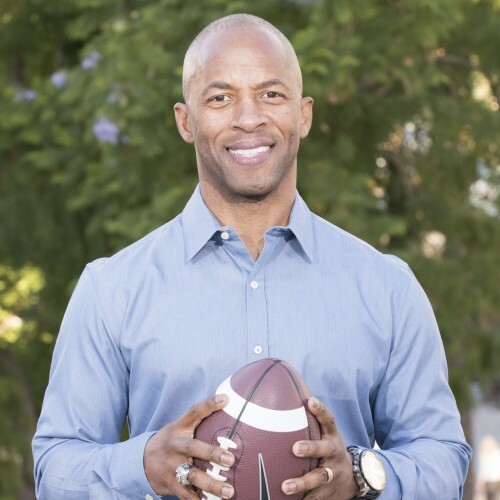 "Success is not going to be given to you"
9yr NFL Veteran, author of "When Opportunity Knocks, 8 Surefire Ways to Take Advantage", JJ teaches that the key to a successful life is seizing the opportunities in front of you no matter the odds, and no matter how much hard work it requires. A 5’10”, 157-pound wide receiver, JJ was drafted by the Cleveland Browns in the 1988 NFL Draft and played nine seasons (Cleveland Browns, Dallas Cowboys, Kansas City Chiefs, and Atlanta Falcons). He certainly wasn’t the biggest, strongest, or fastest guy on the field, but he knew how to seize his once-in-a-lifetime opportunity and maximize his success through dedication and hard work. In his presentations, JJ shares lessons from his experience as a small man in a big man’s game. JJ’s time in the NFL helped shape the message that he now delivers to audiences around the world. After seeing the successes and failures of others at the highest level, he developed a set of principles that others could follow to achieve greatness, no matter how they defined it or what they did. After years of professional speaking engagements, JJ knows how to deliver his message in a way that will resonate with anyone in the audience, regardless of their background or job title. He has spoken in front of all types of audiences, from K-12 students to adults in the athletic and business world. Each presentation is tailored to the audience in attendance, which means your group will walk away with tools, strategies, and principles that will help them excel in their roles and achieve greatness at work, at school, in sports, and most importantly, in life. "Every day, people are unknowingly faced with decisions and choices that help set the course for their future. The problem is that most people don’t have a good enough vantage point to see these moments for what they are; or if they do, they don’t know how to seize such opportunities and make them work for the futures they’ve envisioned for themselves. The key to a successful life is seizing the opportunities in front of you—no matter the odds, and no matter how much hard work it requires. Achieving greatness isn’t easy, but if you’re ready to win, if you’re hungry to turn no into yes and dreams into reality, JJ Birden has a message for you. JJ has made it his life’s work to empower people with the principles of leadership and high performance to achieve their brightest and most successful futures." JJ’s winning philosophy also helped him succeed in an arena with equally staggering odds: the business world. He’s been an entrepreneur and a business partner, as well as the guy at the bottom of the organizational totem pole who had to work his way up. And when you hear him say that the only difference between sports and the business world is the physicality of the game, that the same mindset he had in the NFL helped him achieve success in the business world, that the same mindset can help you perform at the highest levels in your personal and professional life, you can believe he’s speaking from experience. JJ is now a best-selling author with the release of his first book, “When Opportunity Knocks: 8 Surefire Ways to Take Advantage!” He also takes pleasure in being married to his college sweetheart of 27 years, Raina and a father to their 8 children (3 biological and 5 nieces/nephews) while residing in the Phoenix Area. Find out more about JJ Birden at http://www.jjbirden.com.